An ex-soldier claims that terrorist groups’ use of child soldiers caused mental illness. He is suing for health coverage. A former IDF soldier is in a legal battle to be recognized as having been handicapped in battle. The ex-soldier says he is mentally ill due to trauma suffered in war, specifically due to terrorist groups’ use of child soldiers. The man says that during his service in the First Lebanon War, he and fellow soldiers were attacked by child terrorists carrying RPGs more than 10 times. Each time he was forced to open fire, a move that saved his life, but – he says – caused lasting mental trauma. The young attackers now haunt his dreams, he says. The Defense Ministry, defending against the suit, recognizes the plaintiff as mentally ill, but argues that his illness was not caused by his IDF service. Ministry officials say an expert found no connection between the man’s current mental illness and PTSD. Attorney Guy Beiton, representing the plaintiff, agrees that his client’s current illness is not PTSD. However, he argues, it was caused by untreated PTSD. Beiton noted that his client has no family history of mental illness. 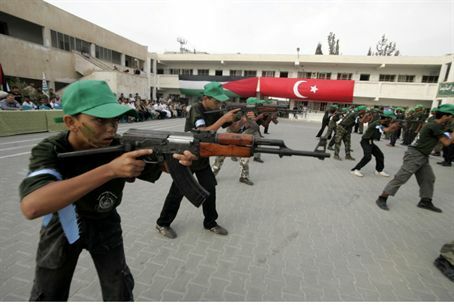 Terrorist groups’ use of children is a known phenomenon in Judea, Samaria and Gaza as well as southern Lebanon. Terrorist commanders hope children will more easily pass for non-combatants. If child terrorists are killed, their deaths are used for propaganda. Several of the Palestinian Authority Arabs who blew themselves up in suicide bombings during the Second Intifada (also known as the Oslo War) were under the age of 18. Children as young as 11 were caught attempting to smuggle bombs through checkpoints. PA media has promoted violence to even the youngest children through cartoons and TV shows, in what psychologists have termed “indoctrination to hatred.” Hamas does the same with child-friendly TV characters that teach hate.